I got a couple nice cards recently from my buddy, Dylan the other day. In it, he had this over sized Cal Ripken from 1995 Upper Deck. This is a hand numbered limited edition card; numbered 4,622 of 5,000. The card is still sealed in the plastic provided by UD with a "Certificate of Authenticity" sticker/seal. 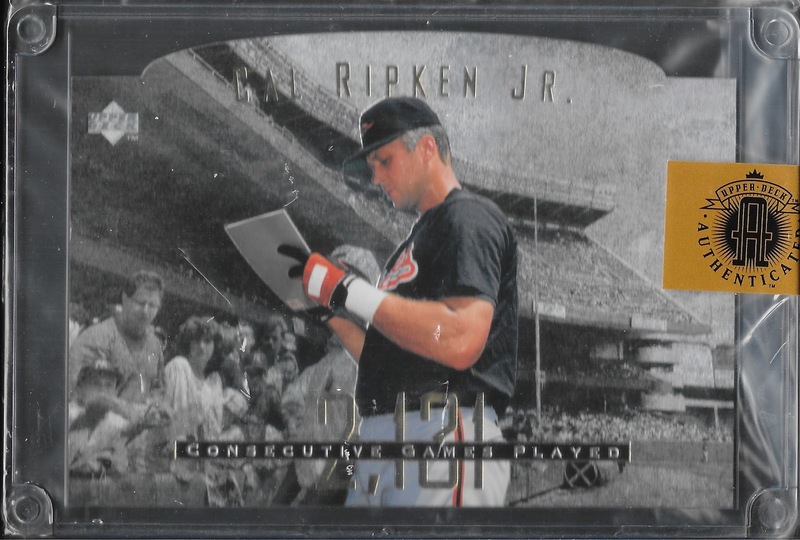 Pretty cool card that I didn't have in the Cal PC. Dylan also included this 2016 Bowman purple chrome refractor of Ryan Mountcastle. This card is numbered 44/250. I don't have a lot of Mountcastle stuff yet, so it was nice being able to add this to the collection. 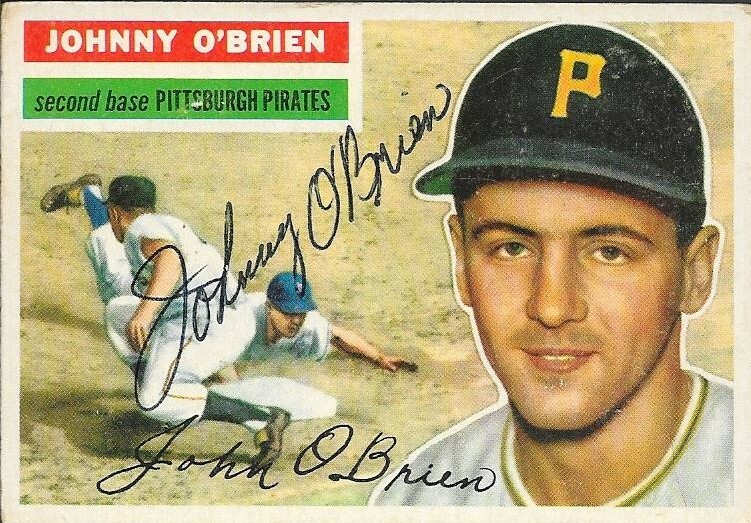 I received a TTM success today from former player, Johnny O'Brien. His cards were some of the last that I have been waiting on that I bought at the Columbia antique shop back in April. I'm happy that I have gotten the cards back, because I was beginning to worry. The above 1956 Topps turned out really nice, I think. I like the play at second base depicted on the card in the background. 1956 Topps is a really nice set, and I believe more and more that I am going to go for this set sometime soon. Of course, I need to get the Mantle. 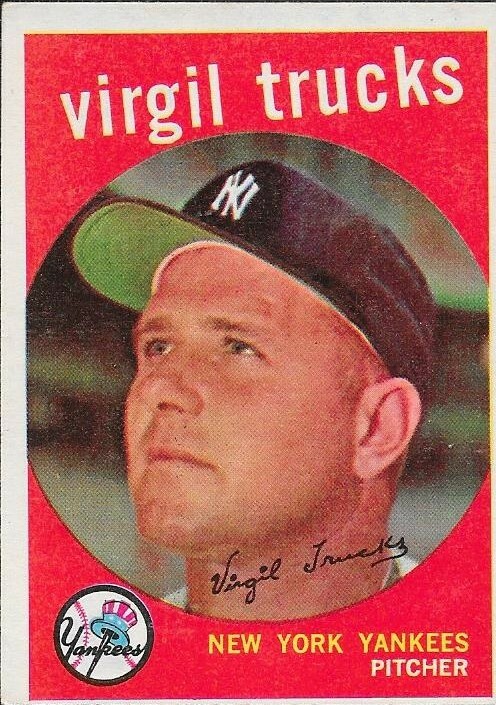 This 1959 Topps also turned out nicely. I'm glad I was able to get this one signed, as well. O'Brien (b. 1930) played in the majors from 1953 and 1955 to 1959 for the Pirates, Cardinals and Braves. He missed the 1954 season due to military service. He had 204 hits, 4 home runs and a .250 batting average over his major league career. He also pitched in 25 games (61.0 IP) in his career. He had a career won-loss record of 1-3 with a 5.61 ERA and 30 strike outs. I mailed to him on April 18 and got the cards back today, for a 102-day TAT. 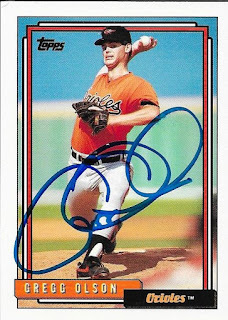 I got a back a TTM success today that I had begun to think I wouldn't see again. 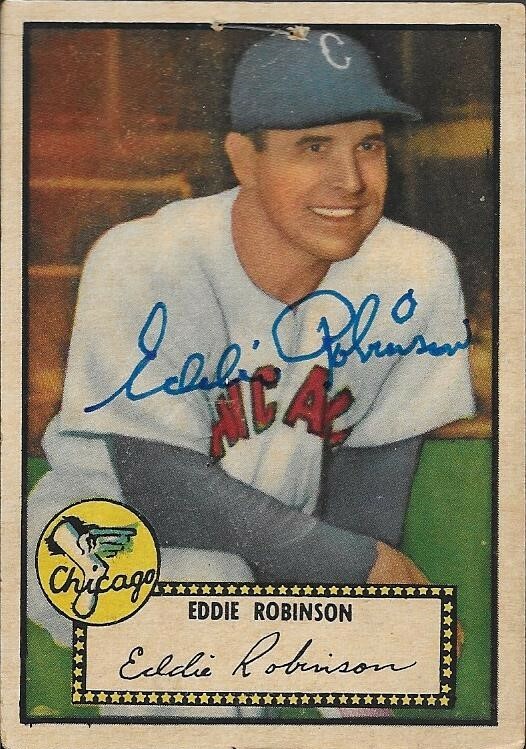 I sent this 1952 Topps to Eddie Robinson on March 19 and got it back signed today, for a 131-day TAT. 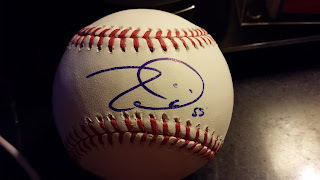 Robinson charges a $10 fee for his autograph, so I had to include that as well. 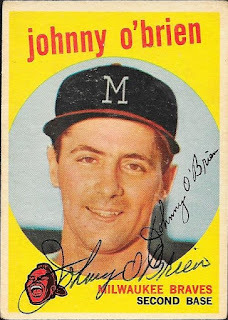 I had gotten him once before, on a ball, but I wanted to get this 1952 Topps signed. The card looks great and his signature does as well. Robinson (b. 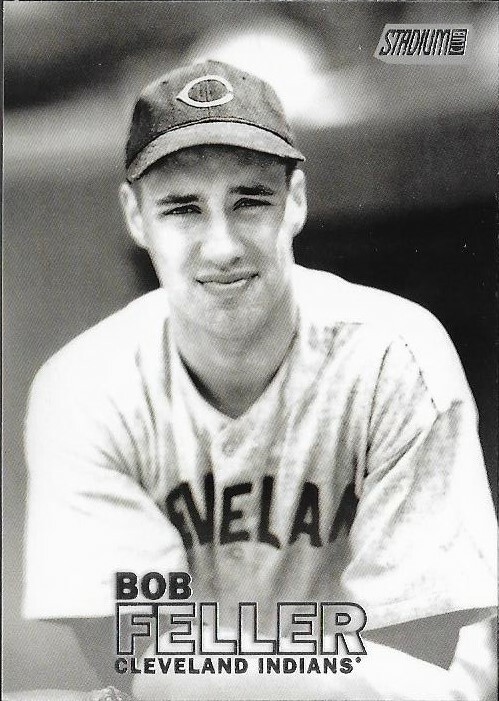 1920) played in the majors from 1942 and 1946 to 1957 for the Indians, Senators, White Sox, A's (Philadelphia and Kansas City), Yankees, Tigers and Orioles. He had 1,146 hits, 172 home runs and a .268 career average. 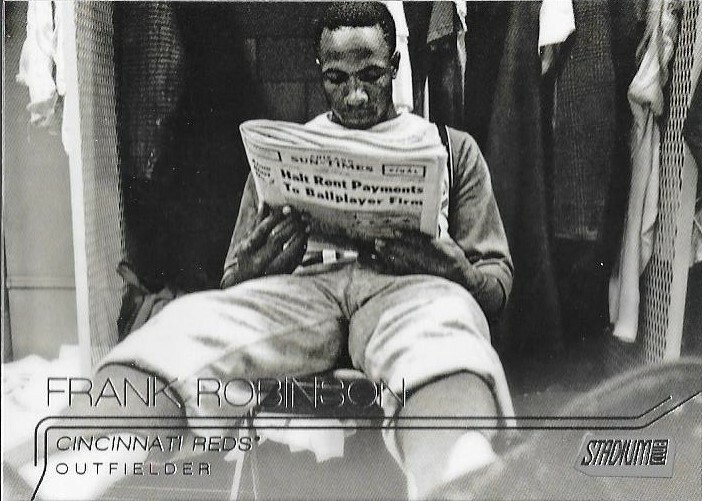 He was a 4-time All Star and finished as high as 11th in the AL MVP voting (1952). 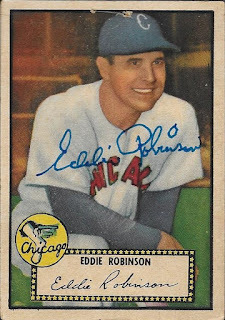 Robinson won the World Series with the Indians in 1948. 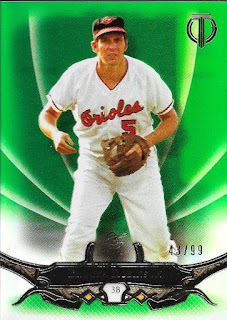 I picked up a nice card for the Brooks Robinson PC when I was in Matthews last week. 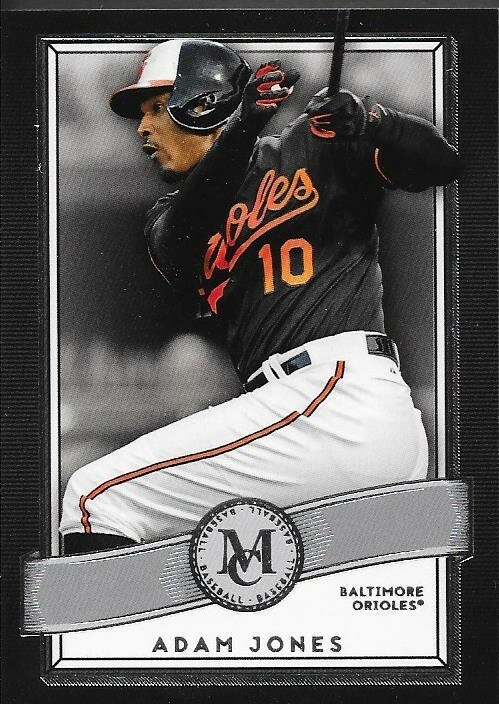 I had asked the shop proprietor if they had any 2016 Orioles that they had pulled recently, and was handed this. 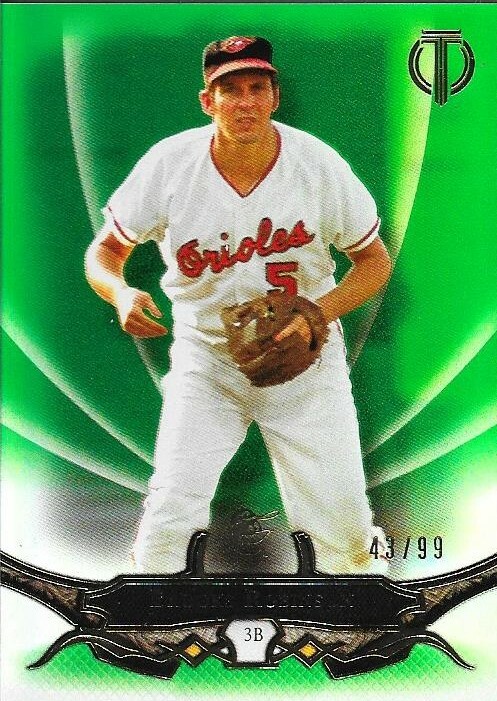 This is a 2016 Topps Tribute Brooks Robinson emerald parallel. The card is numbered 43/99. I haven't opened any Tribute this year. I don't plan on buying any packs, but if I see any good deals on some PC cards, I will probably pick them up. These are really nice cards. I received a package yesterday from my good friend, Noah, that had the Christmas gifts that he meant to send me back at, well, Christmas. Noah has been really busy lately, so it was understandable that the package came a bit... late. No worries, though, as it got here, and there was a lot of good stuff inside. 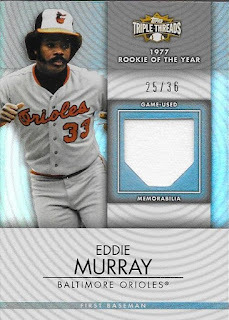 The above 2012 Triple Threads Eddie Murray is a nice addition to the collection. The card is numbered 25/36. Here is a Tim Berry auto from last year's Bowman Chrome. 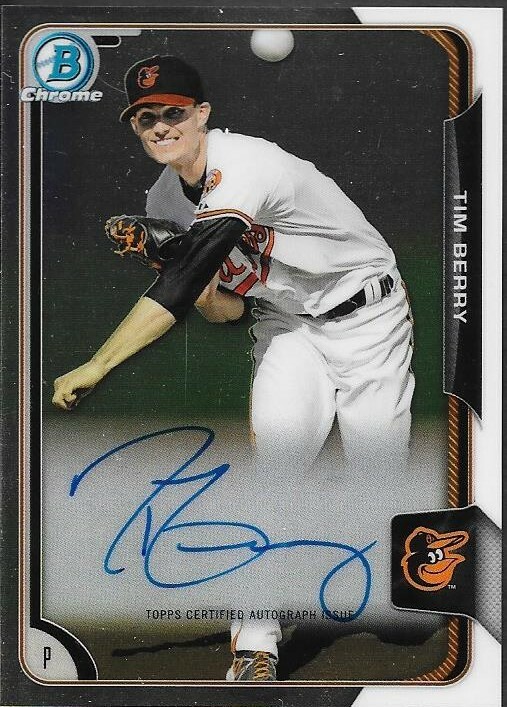 Berry was a decent minor leaguer for the O's and developed into a pretty good story, after being drafted in the 30th round. He got called up by the Orioles, but didn't make it into a game. He is now out of the organization. This 2013 Bowman Chrome black wave refractor auto of Josh Hart is numbered 2/50. 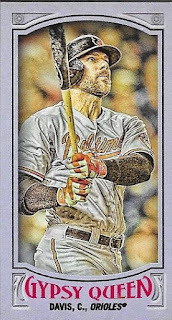 I love the different Bowman Chrome variations. 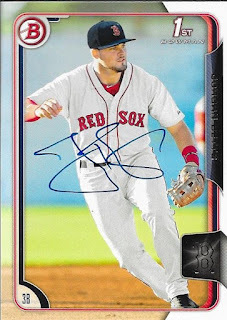 It is too bad that Topps stopped the wave refractors. Thank you for the package, Noah! I recently sold some stuff on my COMC page and used the money to remove my Anthony Rendon Atomic Refractor so I could take it to the National for grading. I didn't want to just get that card, so I looked for something affordable for my PCs. I realized that I didn't add a lot of Adam Jones stuff lately, so I picked up his true RC. Look at how young he is. He is also listed as a Shortstop. Not to mention, he is in his Mariners uniform. I got the card for $9.35. I'm glad I got it. I need to get the auto version at some point. We busted a box of 2003 UD Prospect Premiers last year at the National for some cheap price. I might look for another if it is reasonable. Or just the single. Who knows. I was able to pick up a few singles of 2016 Stadium Club while I was at the Matthews card shop on Friday. I got a few for some other people, but had to add to my PCs as well. I like the shot of Chris Davis above. Stadium Club has quickly become one of my favorite offerings. The photos are great! My LCS has already sold out of Stadium Club, so I will probably be picking up a box at the National. I may also work on the set, like last year. 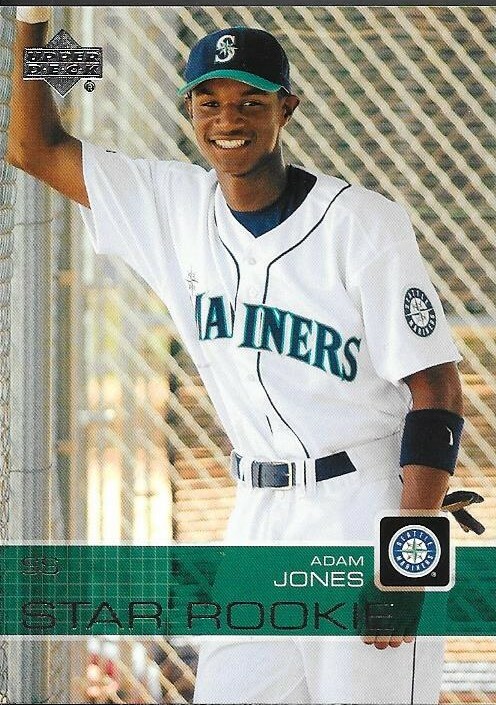 Here is Adam Jones's card. He is about to pie face someone. This is a great shot of Jonesey, as it fits his personality perfectly. 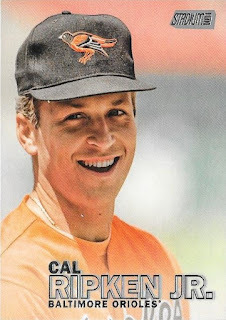 Here is a new Cal to add to my PC. As always, any time I can add a new Cal, that's a good day. Finally, I picked up this Bob Feller for the Feller PC. 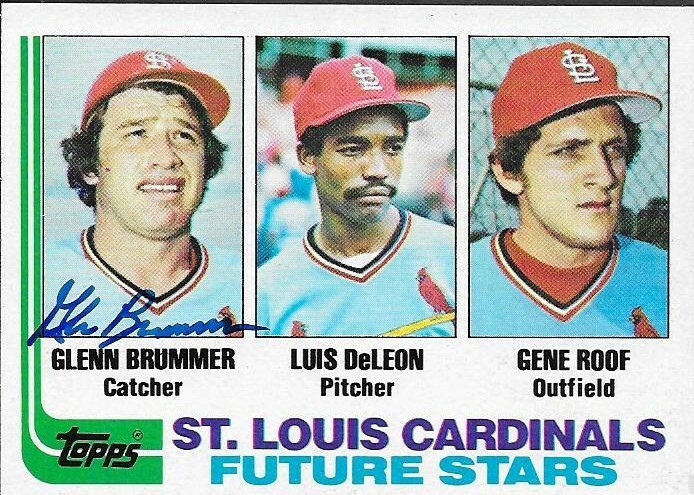 It is tough getting new Feller cards, so adding this was nice. This is a shot of a younger Feller, earlier in his career, it seems. 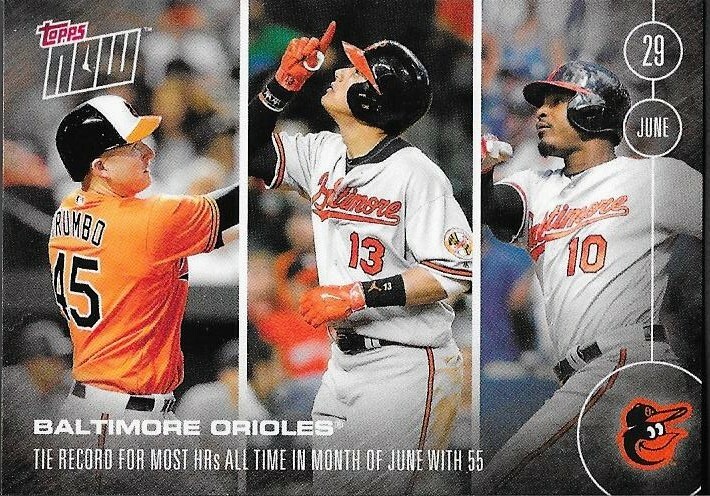 I hope Topps keeps up with Stadium Club. It really looks great this year! I was out of town the last couple of days doing some training for work. While I was heading out of town from the corporate office, I stopped by AAA Collectibles in Matthews, NC. I used to go there a lot before I moved away from Charlotte, but since then, I have only been back a couple times. The lady who co-owns the shop remembered me right away, which was nice. I picked up a few things while I was there. I got 19 cards for my Stadium Club set, which really helps me out. That gives me less to look for next week at the National. It's funny, some of the cards I needed were Orioles. 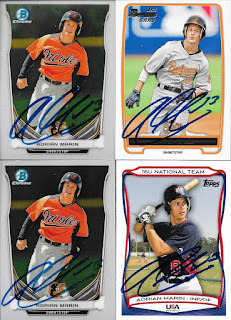 I have the above Chris Davis, but I got it for my PC before I decided to complete the set. I'm not too far away from finishing the set now, which is nice. I'll be glad to finish it up and put the album on the shelf. 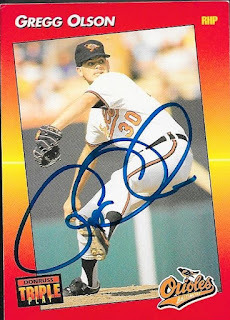 I received a TTM success today from former Orioles closer, Gregg Olson on two cards that I sent out on February 18. It took a while, but they came back looking great! 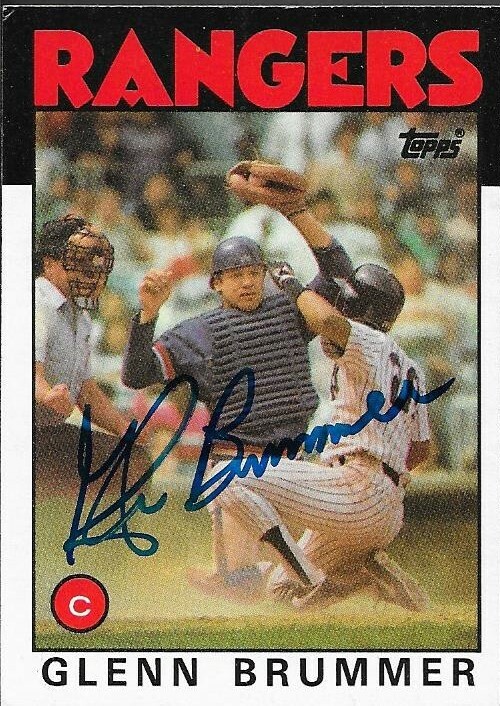 The above 1992 Topps turned out really well, and it was sent off before I considered doing my Topps Autograph Project. This 1992 Donruss Triple Play came out of a care package that my good friend, Patrick, sent me a while back. I'm glad to be able to "upgrade" this card and add it to my TTM album. Olson (b. 1966) played in the majors from 1988 to 2001 for the Orioles, Braves, Indians, Royals, Tigers, Astros, Twins, Diamondbacks and Dodgers. He had a career record of 40-39 with an ERA of 346 and 217 saves. He was the 1989 Rookie of the Year in the AL (the last Oriole to receive that award) and also finished 6th in the AL Cy Young voting and 12th in the AL MVP voting that year. He was an All Star in 1990. I mailed to Olson on February 18 and got the cards back today for a 153-day TAT. My "To Be Blogged" pile is getting a lot smaller these days. I haven't gotten any TTMs in, and I have tried really hard to stay off of Ebay, since the National is getting so close. This has afforded me the opportunity to catch up on some much needed posts, since the TTMs set me back a couple of months. Right when it came out, I picked up some Gypsy Queen mini parallels off of Ebay, since my LCS sold out so quickly. 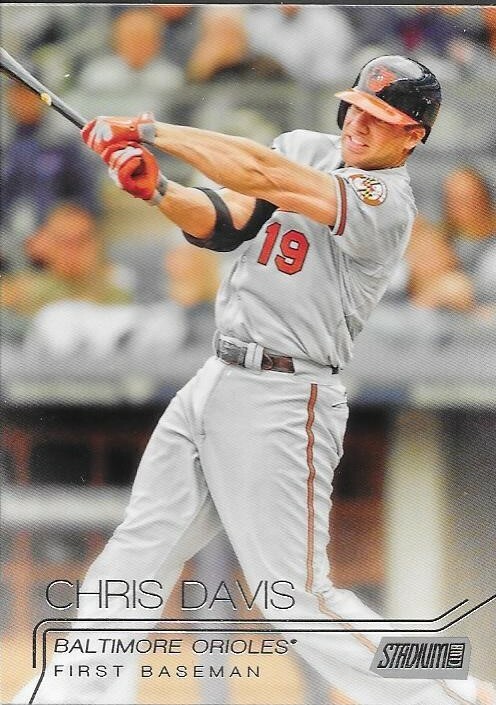 The above purple Chris Davis mini is numbered 79/250. I also got this gold parallel, numbered 26/50. Both of the cards look really nice. I doubt I will go for the rainbow, but if I see some of the other parallels, I will probably pick them up. My buddy Michael hooked me up recently when he took some Adrian Marin cards that I had sent him and got them signed for me. He has met Marin several times and arranged to get me some autos. 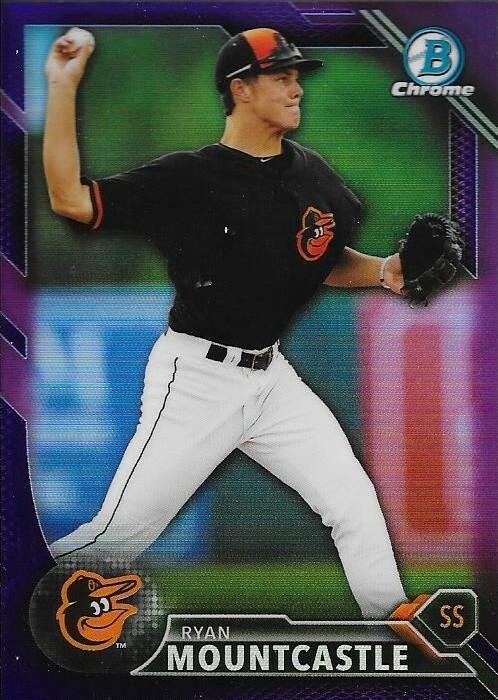 Marin was a 3rd round draft pick by the Orioles out of a Florida high school. He is currently in AA Bowie where he is batting .242 with 3 home runs across 79 games. I really appreciated Michael going out of his way to get these cards signed for me. I appreciated even more that I was able to go out to dinner with Michael recently when I was in Baltimore. He has been a good friend for a long time, and any time I am in Baltimore, I try really hard to meet up with him. Thanks so much for the autos, Michael! I got a surprise email recently from fellow blogger, Chris, from the blog "Nachos Grande". He had a few 2015 Stadium Club for my set. I really appreciated him sending them along, because these cards are beginning to be harder and harder to find. One question I had for myself, though, was "Don't I already have this Frank Robinson?" If I do, it is likely in my Orioles box somewhere. Maybe it made its way in there before I decided to do this set. Oh well. The 7 cards that Chris sent along will help me fill some holes in the Stadium Club binder. Maybe I can complete this set at the National? My good friend Max sent me yet another care package recently, this time with a bunch of base cards to take with me to The National, for the VIP signers. I'm going to try to get a few things signed for him, but it is going to be tough, since the handlers pretty much don't let you get more than one item signed at a time. I intend to use some of my Wild Cards to help Max's collection out. Max did include some cards for my collection in his package, as well. 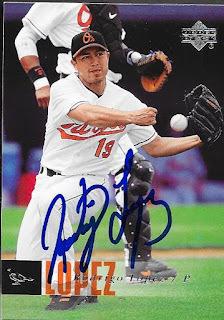 He sent me a Mychal Givens auto that he pulled out of 2016 Topps and the above IP auto he got from former Oriole, Rodrigo Lopez. Lopez (b. 1975) played in the majors from 2000, 2002 to 2007 and 2009 to 2012 for the Padres, Orioles, Rockies, Phillies, Diamondbacks and Cubs. He had a career record of 81-89 with a 4.82 ERA and 865 strike outs. 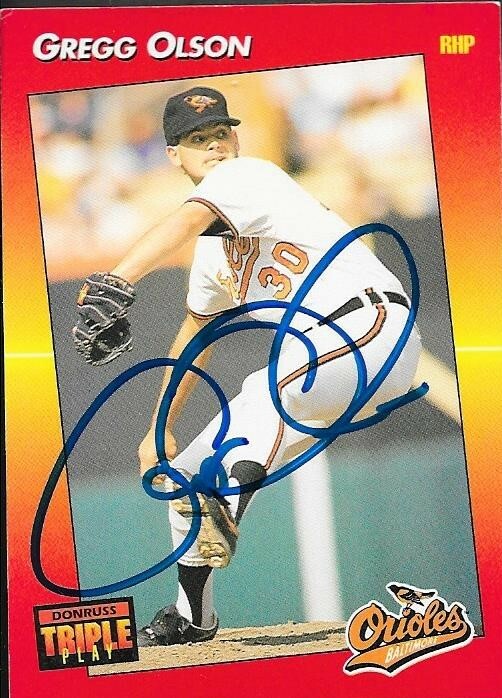 He was signed by the Orioles as a free agent out of the Mexican League in November 2001. He would finish second on the 2002 AL Rookie of the Year voting to Eric Hinske after he went 15-9 with a 3.57 ERA that year. In his five seasons with the Orioles, he was 60-58 with a 4.72 ERA. 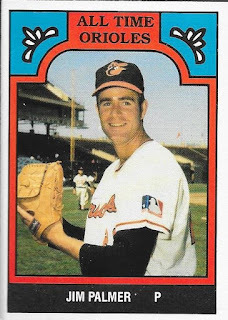 He won 14 or more games for the O's three of those five seasons. His 2006 season when he went 9-18 with a 5.90 ERA really skews his stats; he was a decent pitcher for a terrible O's team during those seasons. One must wonder how Lopez would have fared had he had a better team behind him, such as the current Orioles. I always liked Lopez when he was with the O's. I was sad to see him get traded to the Rockies for Jason Burch and Jim Miller in January 2007, but his time had pretty much come. I love that Max thought of me to get this card signed. Thanks a lot, buddy! Care Package From My Buddy, Josh F.
I got a nice care package back in June from my buddy, Josh F. after he had let me know I had something on the way. He is a big Patrick Corbin and Jason Grilli fan, and I have sent him a bunch of their cards for his collection. 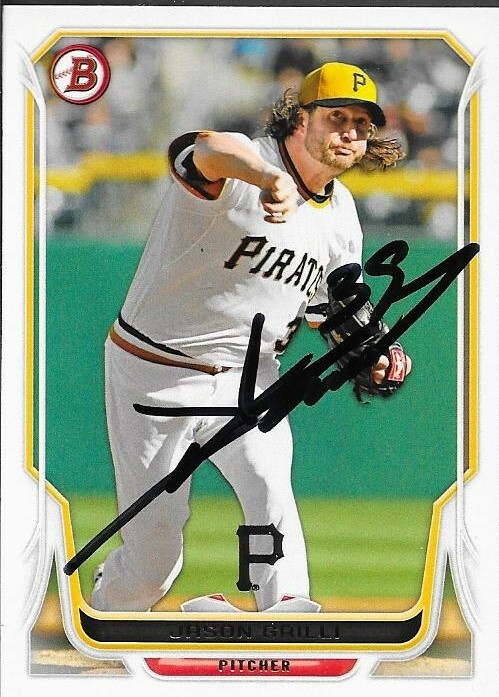 I was pleasantly surprised when Josh included one of the cards that he had signed by Grilli. 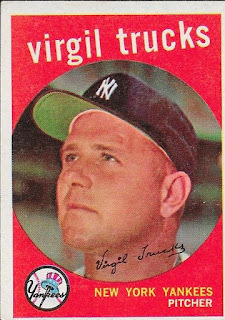 Josh had found this 1959 Virgil Trucks and remembered that I liked him, so he included it in the package. I have the card already, but am always happy to take on another Trucks for the collection. Josh also included a bunch of Orioles cards. 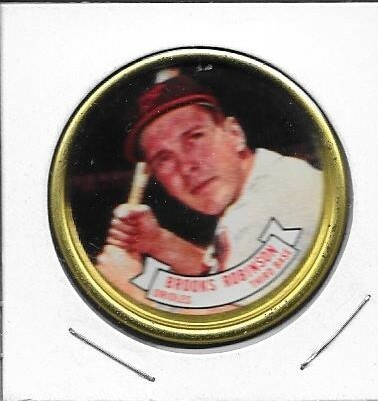 Among them was this Topps Coin of Brooks Robinson. These are really cool, and I don't really see too many of them, these days. Thank you so much for the care package, Josh. I hope I can find more cards for your PC really soon! I used my Ebay bucks to get a deep discount on a card that has been on my watch list for a long time. 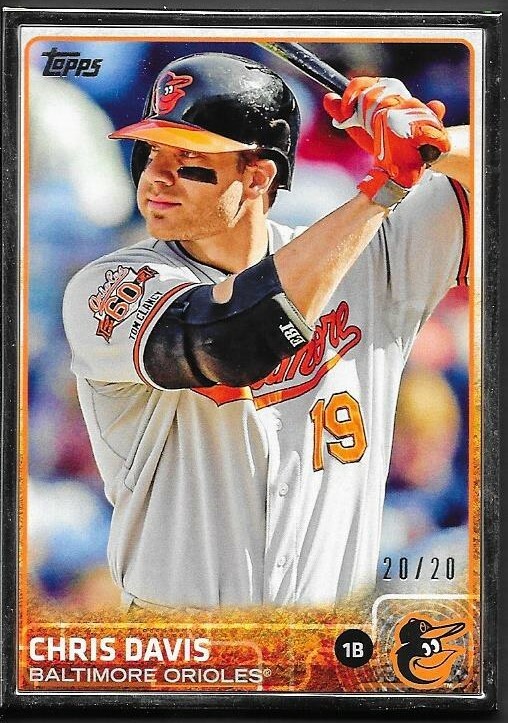 I got this 2015 Topps Chris Davis silver framed card at a great price. I had watched it for so long, the price dropped, then with the Ebay Bucks, I got a sweet deal. 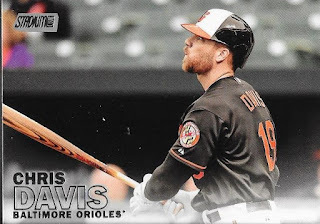 I doubt I will complete a Topps rainbow of Davis, but landing this card numbered 20/20 would help me if I can find the 1/1. 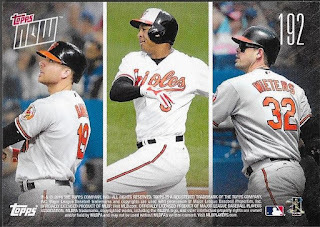 Topps came out with a really cool idea this season by putting the previous day's highlights on a card. The concept gets even better in that the cards are only available for order for 24 hours, then the print run stops. Some cards have been run for 200+ copies; some for over 1,000. 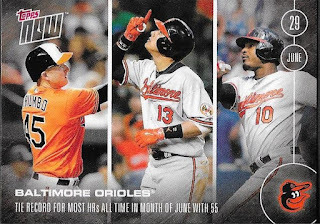 There have been a couple Orioles ones issued this year, but I finally took the plunge on Topps Now when the Orioles tied the home run record for June. I bought the card off of the Topps website for $9.99 and it ended with a print run of 526 copies made. 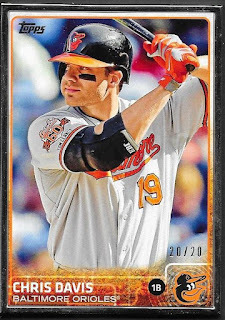 This card will be an entry in my Chris Davis PC, but when I was scanning the card for this blog post, I noticed something about the card that I didn't realize before. Have you caught it yet? That is Matt Wieters on a Topps card. Why does that matter? Well, since he signed with the Orioles, Wieters has not been featured on any Topps products, with the exception of Topps Bunt and E-Topps. He has had no regular issue Topps cards. He signed an exclusive deal with Razor back in 2008 that would have allowed him to appear on Topps or Upper Deck cards one year after his debut. He has had no Topps cards at all, so either he or they have not budged. 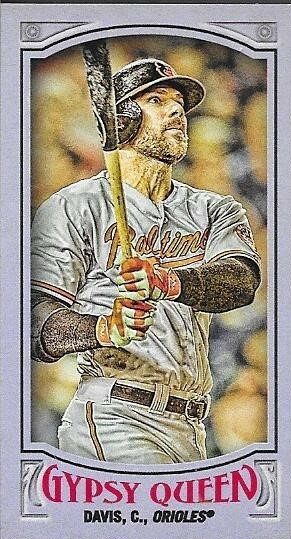 So, this Topps Now card could be his first ever Topps card (really, who counts E-Topps or Topps Bunt?). That makes this card that much cooler for me. There are two other Chris Davis Topps Now cards that I have seen. I plan on picking them up, but am holding out for the National. My hope is that a vendor there will have them, and I can rack up. I really like this concept and hope that Topps keeps it up. I also hope some of my PC guys do some major things to end up on future offerings. I had a TTM return waiting on me when I got home from Baltimore, yesterday. The envelope had come on Saturday, but I was sitting in the heat, watching the Orioles beat the Angels. Inside the envelope was a success from former player, Del Crandall. 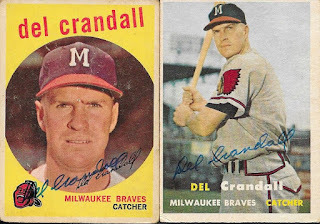 Crandall charges $5/card, but since I bought all of these cards at the Columbia antique shop in April, I went ahead and sent $20 to get them all signed. Above are the 1953 and 1954 Topps that I got signed. They both turned out great. I feel like I really enjoy getting the 53s signed for some reason. I wish I had the money to build that set, but that one will cost an arm and about 8 legs. 1954 Topps is a great set, too, and it is one that is far more realistic to pursue. Here are the 1957 and 1959 Topps that I got signed. 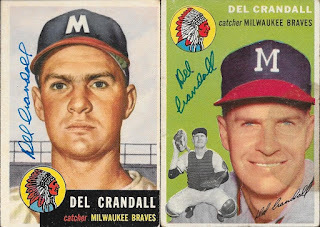 I like the huge Braves logo on Crandall's sleeve on the 1957. Both of these turned out nice, as well. Crandall (b. 1930) played in the majors from 1949 to 1950 and 1953 to 1966 for the Braves (Boston and Milwaukee), Giants, Pirates and Indians. He had 1,276 hits, 179 home runs and a .254 batting average. 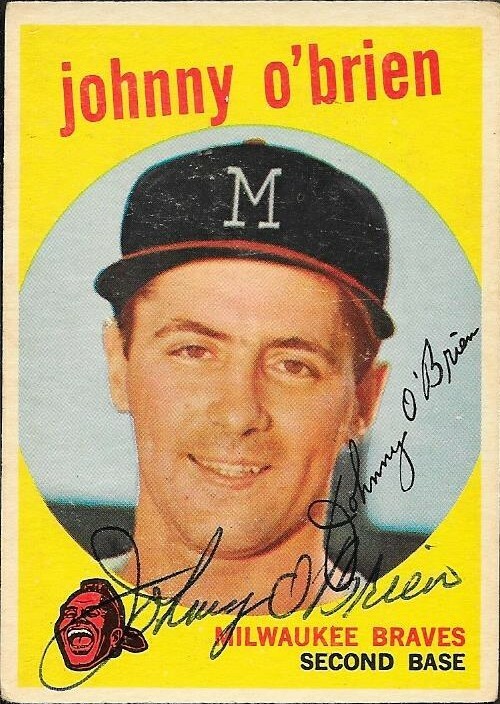 He was an 8-time All Star (1953 to 1956, 1958 to 1960 and 1962). He finished second in the 1949 NL Rookie of the Year Award voting to Don Newcombe and finished as high as 10th in the NL MVP voting (1958). Crandall was also a 4-time Gold Glove Award winner. He won the World Series with the Braves in 1957. He appeared on the Hall of Fame ballot 4 times between 1976 and 1979, but only got as high as 3.9% of the vote. I mailed to Crandall on June 27 and got the cards back on Saturday (July 9) for a 12-day TAT. 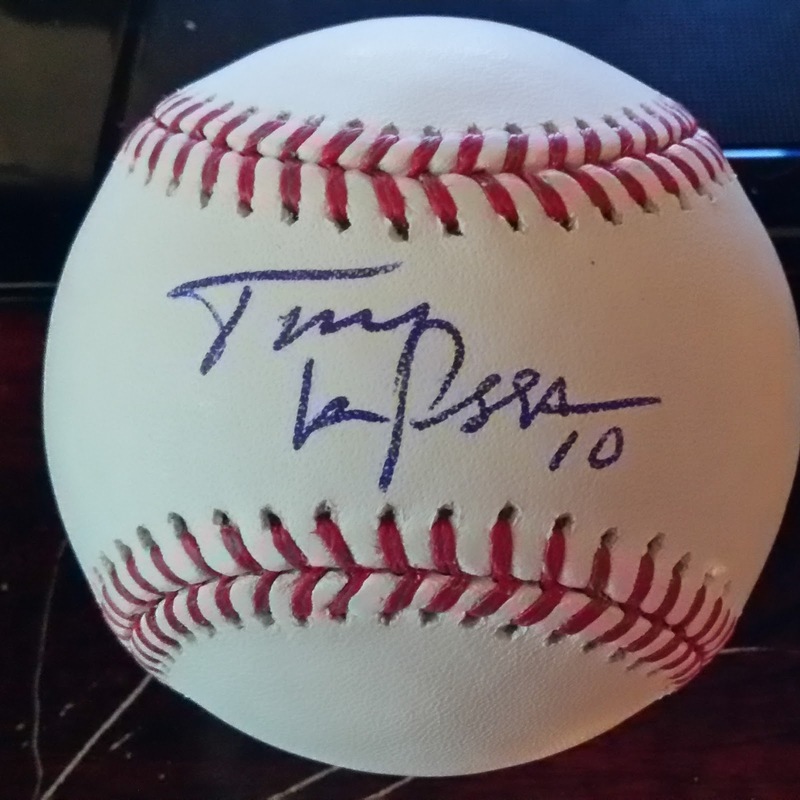 I haven't added to my Hall of Fame signed baseball collection in a long time, so I decided when I got my case of OMLBs in for the National, I would go ahead and try Tony LaRussa TTM to go ahead and get one out of the way. 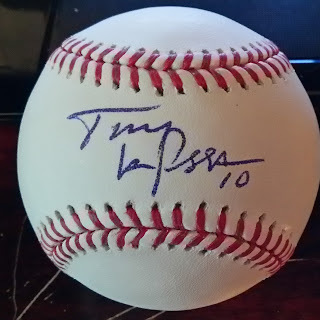 I mailed to LaRussa on June 27 and got this ball back on Friday (July 8) while I was in Baltimore. Still counts as an 11-day TAT. LaRussa (b. 1944) played in the majors from 1963, 1968 to 1971 and 1973 for the A's (KC and Oakland), Braves and Cubs. He had 35 hits, no home runs and a .199 batting average. LaRussa would become the manager of the Chicago White Sox in 1979 and would go on to manage from 1979 to 2011 for the White Sox (1979-1986), Oakland Athletics (1986-1995) and St. Louis Cardinals (1996 to 2011). He amassed a 2,728-2,365 record (.536) over 33 seasons. He was the Manager of the Year in 1983, 1988, 1992 and 2002. He led the White Sox to the post season in 1983, losing to the Orioles. He took the A's to the World Series in 1988, 1989 and 1990, winning in 1989. He led the Cardinals to the World Series in 2004, 2006 and 2011, winning in 2006 and 2011. LaRussa was elected to the Hall of Fame in 2014 by the Veterans Committee, in his first time on the ballot. He is my 122nd Hall of Famer on a baseball. I had one of my best IP autograph success today, almost by accident. 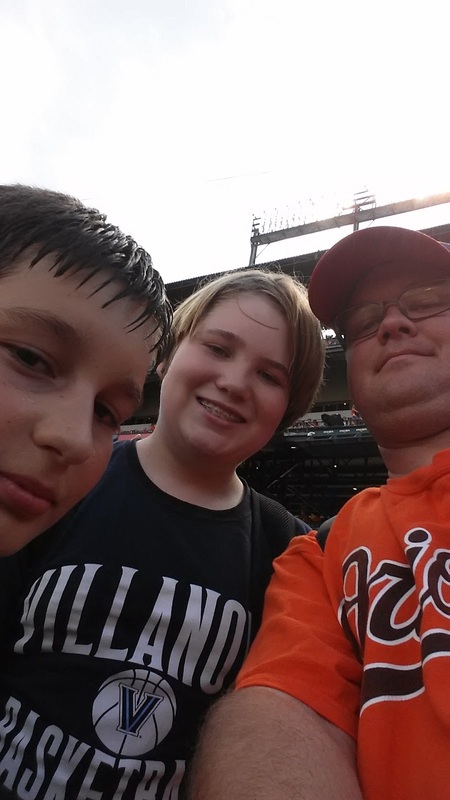 I am in Baltimore with my sister and have tickets to the Orioles series against the Angels. 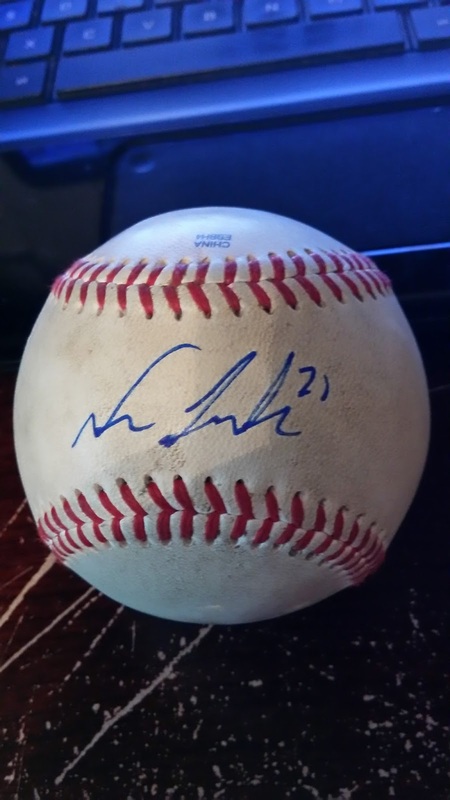 My goal was to try to get Mike Trout on a ball. 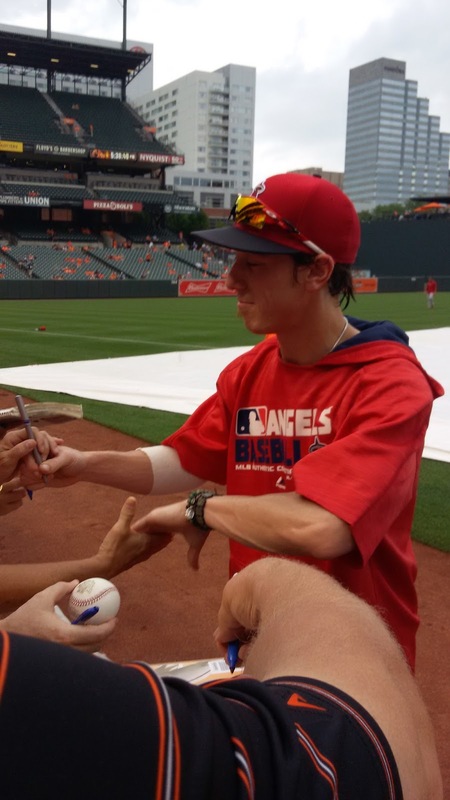 I was actually really close to getting him, but I wasn't quite lucky enough, but I did get someone pretty awesome, Tim Lincecum. You can see the ball that I got signed, it turned out great. When Lincecum came up to where I was at, a small kid in front of me who had already had his ball signed offered to get mine signed as well, since he was right up against the wall. This helped my ball get to the front, and Tim signed it. While he was signing, I told him "You are my son's favorite player, ever. He loves you!" Tim looked at me, smiled and said "Make sure you tell him I said hello!" I got out of the crowd and jumped on my cell phone to call my mom. Chris, my son, is visiting my parents, so she had to get him out of the pool and to the phone. I told Chris what Lincecum said and he was speechless. I really wish Chris had been able to make the trip, but my fear is that had he been here, Lincecum wouldn't have been signing. I was graphing with my friend from Instagram, Stefan, and another Instagrammer, Brian. Stefan was able to get Lincecum twice and then got Trout! Stefan has pledged to help me get Trout tomorrow, so maybe I will come away from this trip with some really good autos! I had a really good time hanging out with the guys. I am now getting into meeting up with fellow graphers, and have hat a lot of fun. I know I'm really late to the game, but these kids have a lot of knowledge and expertise! 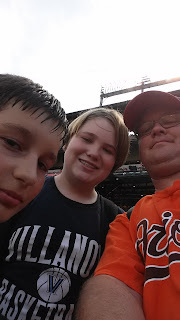 As far as the game, I hope that I am able to say that I saw Ubaldo Jimenez's last start as an Oriole. You hate to see someone lose their job, but with the $50 million contract that he signed, he isn't hurting. Let's hope Buck can find some decent starters somewhere, lest the Orioles lose their grip on the AL East lead. 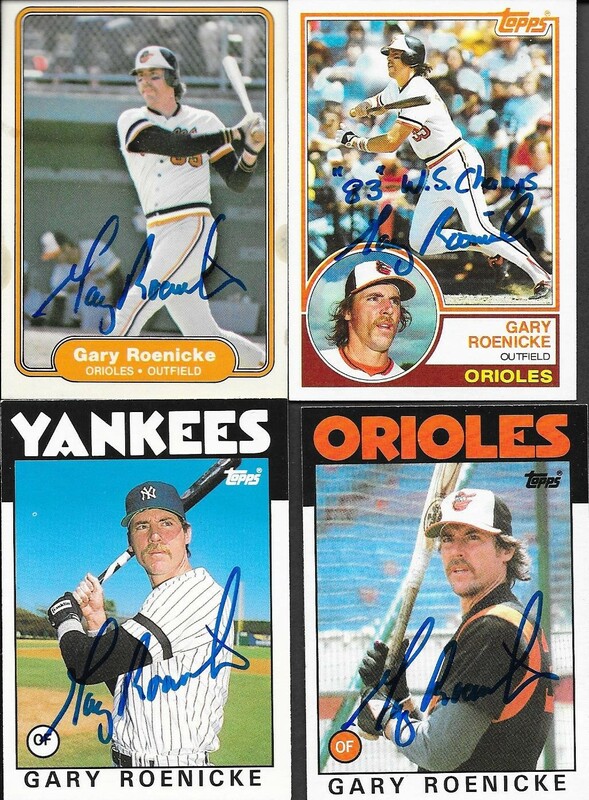 I got a TTM success on Tuesday from former Oriole, Gary Roenicke, one I have had out for quite a while. I got this nice 1980 Topps signed in blue sharpie. I also gut a 1982 Fleer, 1983 Topps, 1986 Topps and a 1986 Topps Traded. The all came out great, but the 1983 Topps is especially nice, since he inscribed it "83 WS Champs". 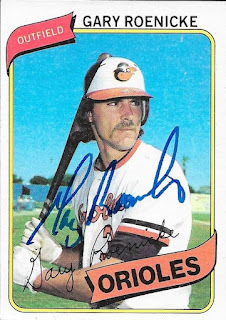 Roenicke (b, 1954) played in the majors from 1976 and 1978 to 1988 for the Expos, Orioles, Yankees and Braves. He had 670 hits, 121 home runs and a .247 batting average over his career. He won the World Series in 1983 with the Orioles. 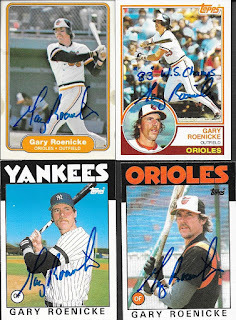 I mailed to Roenicke on April 18 and got the cards back on July 5, for a 78-day TAT. I kept a tradition alive this week when my wife and I went to a minor league game for July 4th. This year, like we have the few years prior, we went to Zebulon, NC for a Carolina Mudcats game. 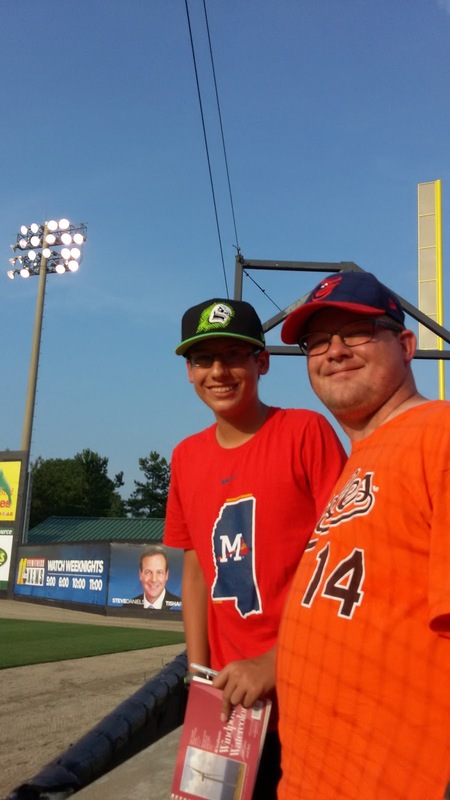 We used to go to Kinston Indians games, but since that team left town, Zebulon is now the closest team to us. I met up with one of my good friends, Dugan, and we did a little bit of "graphing" before the game. I always sit on the visitors side, as I feel like that gives me the best chance at getting stuff signed. I didn't have a whole lot of cards of the visiting team, the Salem Red Sox, but I had several cards of their manager (Joe Oliver) and a few remaining prospect cards that I found in my rookie box. I was able to get three cards signed, which was nice. 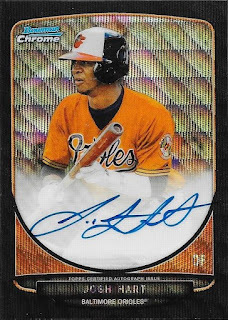 The above 2015 Bowman Jordan Betts turned out really well. I had a thin point blue sharpie, but I feel like it did a pretty good job. 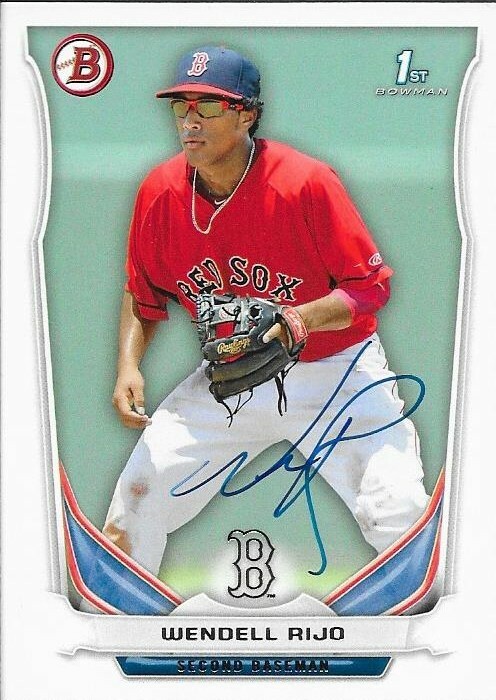 Here is a 2014 Bowman Wendell Rijo. 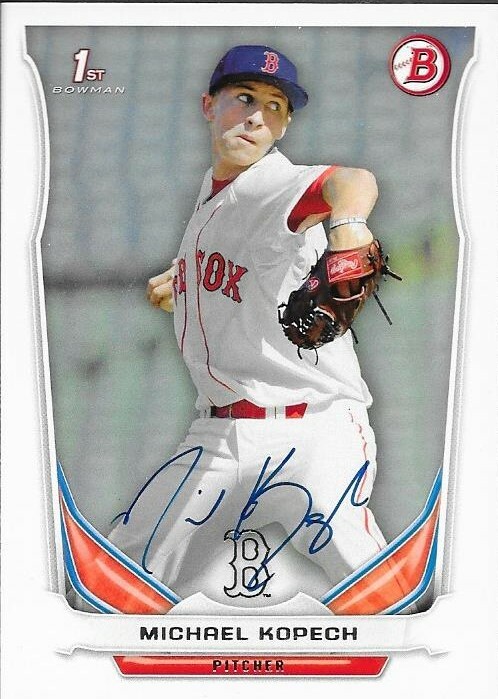 His signature isn't as nice as Betts's, but it still looks fine. Finally, I got a 2014 Bowman signed by Michael Kopech. His signature isn't too great, either, but I was still happy to come away with a few autos. I had never taken cards with me to "graph", I always have used baseballs. I liked how I did, except I am terrible at recognizing who the players are, especially when they are walking toward you, and their numbers are only visible on their backs. Here is a nice picture of my buddy, Dugan and I. He was way more successful at getting his stuff signed. He is a pro at "graphing" and helped me figure out who was who. I really enjoyed spending time with him, and plan on taking him up on his offer to "graph" at Durham Bulls games. 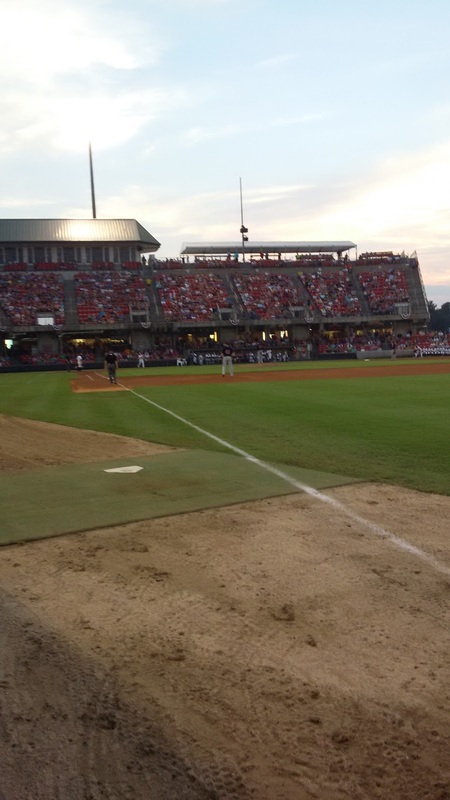 I enjoy Five County Stadium and watching the Mudcats. I always have a good time when I go there, and always try to go at least once a year. 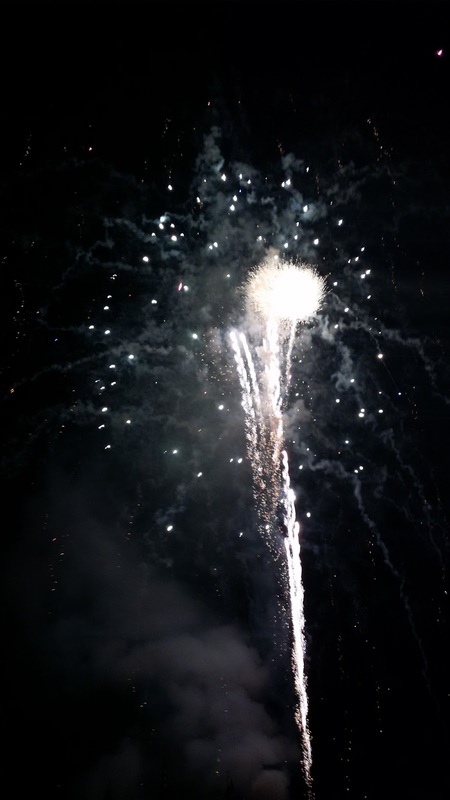 The fireworks show was great, as usual. My wife and I try to hit a minor league game on July 4th, and always come away happy with the post-game show. The Mudcats won the game, 9-6. I was tossed a ball from Salem right fielder, Nick Longhi (which I dropped, and he re-threw to me). I gave the ball to my sister who is in town and accompanied us to the game. After the game, I flagged Longhi down and had him sign the ball for her. He also hit a home run in the losing effort. 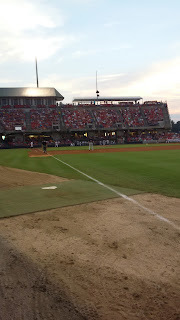 I had a really good time at the Mudcats game. It was really nice spending time with my wife and sister, but it was also nice to be able to see and spend time with my great friend, Dugan. He is a great guy, and I know we will be catching many more games together in the future. I got a TTM success back today from former catcher, Glenn Brummer. I wanted to send to him when I saw the action shot on this 1986 Topps. It turned out really nice. This was his only card that I had, until my good friend, Max, hooked me up with a few more. 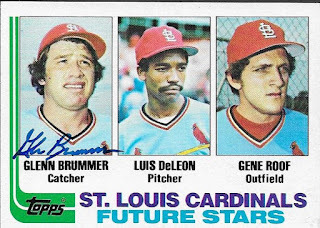 This 1982 Topps Cardinals Future Stars card turned out really nice, as well. I doubt I will go for the trifecta on this, but you never know. I'll have to see if the other guys sign. 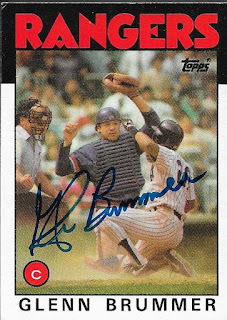 Finally, here are a 1983 and 1984 Topps that Brummer signed for me. They also look great, as he has a really nice signature. Brummer (b. 1954) played in the majors from 1981 to 1985 for the Cardinals and Rangers. He had 87 hits, one home run and a career .251 batting average. He won the World Series with the Cardinals in 1982. 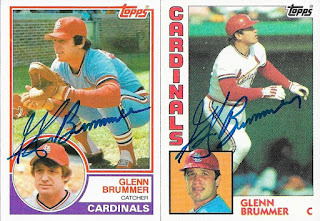 I mailed to Brummer on June 27 and got the cards back today (7/5) for an 8-day TAT. I got a care package of a bunch of Orioles cards from my good friend, Robert, back on May 5th. 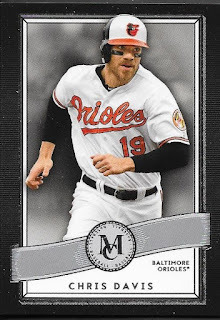 He had busted a box of Museum Collection and ended up with some O's and sent them along with some other random Orioles. I didn't have this Chris Davis in my collection, yet, so it helps out my PC. 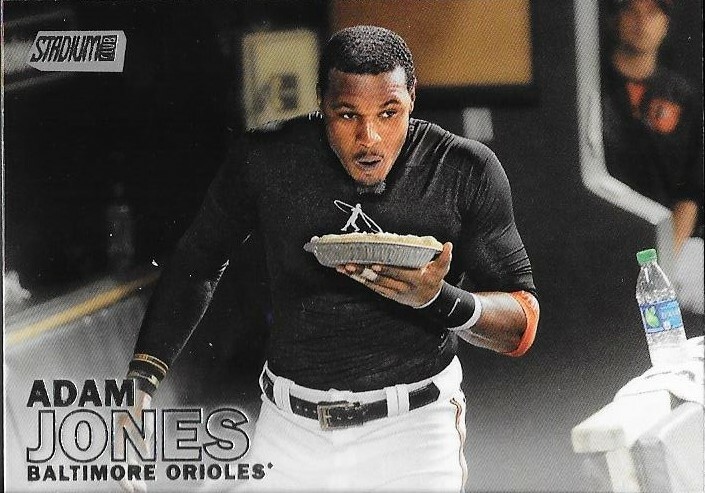 I also didn't have this Adam Jones. I like Museum Collection. 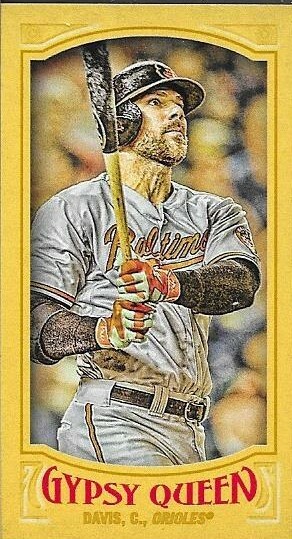 It may very well be my favorite Topps offering, aside from Topps base. 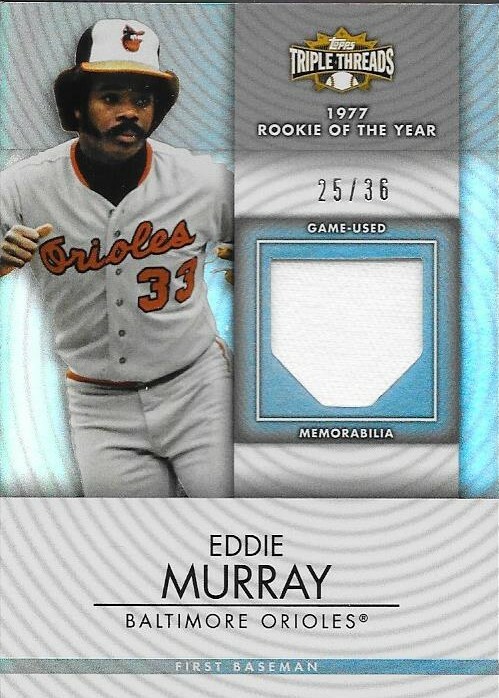 I doubt I will pick up a box, but if I see any nice Orioles patches and relics, I will be sure to pick them up. I appreciate the cards, Robert. Thank you! I got a nice care package from a fellow instagrammer, Jeff back on May 5 and I finally am able to post about it. I helped Jeff get some good cards recently, and he has helped me with some nice care packages. I really appreciated the care package, and I wish I had gotten them posted sooner. Thanks for the cards, Jeff!